Argentina became the first foreign nation to purchase the A-4 in 1965, when a contract was let for 75 surplus U.S. Navy A-4Bs. The first 25 aircraft were delivered in 1966 and were all refurbished A-4B aircraft and were redesignated the A-4P. A second batch of 25, also refurbished A-4Bs, were delivered in 1970, then a final batch of 25, this time from surplus A-4C stocks, was delivered in 1975. The Argentine aircraft differed from USN Skyhawks in having spoilers added to the wings, an DF203 radio compass antenna on the back, AN/ARA-50 UHF/ADF antennas on the nose, and “grab handle” VOR/ILS antennas on the vertical tail. In addition, the A-4Cs in Argentine service were capable of firing the Sidewinder missile. In 1971 an additional 16 refurbished A-4Bs, designated A-4Qs, were purchased to equip the airwing for the aircraft carrier <I>25 de Mayo</I>. These aircraft received similar upgrades to the FAA A-4Cs and were also capable of firing Sidewinders. Of the 91 Skyhawks delivered, about 50 were still active at the outbreak of the Falklands war in 1982. Several attempts were made to operate the A-4Qs from <I>25 de Mayo</I> at the beginning of the war, but without success as the old carrier was unable to get sufficient speed to safely catapult the war-loaded A-4Qs from deck. Thereafter, the Argentine Skyhawks, both FAA and Armada, operated from shore bases for the duration of the war. Nineteen were lost in combat. A-4Qs were retired in 1988, shortly after <I>25 de Mayo<I> was decommissioned. A-4Ps continued in service until 1999. These aircraft have been replaced by refurbished A-4M aircraft, redesignated the A-4AR Fightinghawk. The base kit is the Hasegawa A-4C. A preview of this kit can be found here. 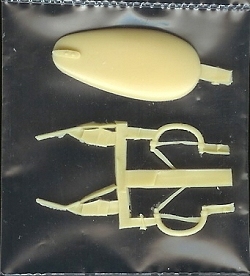 The basic plastic is identical to the USN A-4C release, except that the sprues also include parts for the A-4B nose and instrument panel. In keeping with Hasegawa practice, no external stores are given beyond drop tanks. You’ll need the weapons sets or the spares box to arm your Skyhawk. A small fret of resin parts are included for the DF203 radio compass (the bulge on the back), the VOR/ILS antennas for the vertical tail, and the AN/ARA-50 UHF/ADF antennas for the nose. These parts are well cast but some careful cleanup will be required, especially for the AN/ARA-50 antennas. I compared the DF203 bulge with the one in the Hobbycraft A-4 kit, and Hasegawa’s is far more accurate in outline. Instructions are a bit busy but do clearly illustrate where the extra parts go. The builder will need to be careful to not mix up A-4P and A-4Q components during assembly. Using a highlighter to mark what steps need to be done for the variant you’re building is a good idea. 1. A-4Q, Fuerza Aerea Argentina, Grupo 4, Falklands war, dark earth and sandy yellow camoflage over white. 2. A-4P, Armada de Argentina, 3 Escuadrilla, 1984, gull gray over white. 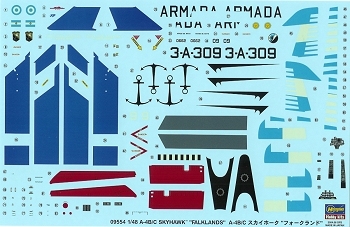 The decals are printed on standard Hasegawa decal stock, and include the blue ID bands for the A-4Q. While the markings are accurate, the stencils are not; all of the stencils are printed in English! I’ve had success using Hasegawa decals, but since you’ll need aftermarket for accurate stenciling, you might as well go that route for your markings. The kit is rather pricey for what you get, and that may be off-putting to some. On the other hand, having an A-4B available again from Hasegawa is a definite plus (it has been issued only one other time), and the accurate resin parts for the Argentine aircraft are helpful. Recommended.